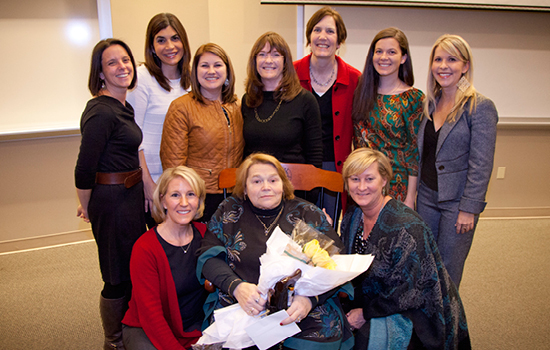 Letting go is tough for students and faculty when someone like Sarah Freeman PhD ARNP FAANP (seated above) retires from the School of Nursing, where she taught for 21 years. They will miss her homemade cookies and muffins. And her sense of humor. "Sarah is a no-nonsense, tell-it-like-it-is truth-teller," longtime colleague Maureen Kelley PhD FACNM, Independence Chair and clinical professor, told guests at Freeman's retirement celebration. To illustrate, Kelley quoted one of Freeman's trademark lines: "You are about to exceed the limits of my medication." All kidding aside, Freeman has made an indelible mark during her 47-year nursing career. A nurse practitioner since 1981, Freeman led the way in women's health and chronic disease management. She helped establish national accreditation for advanced practice nursing programs and served on the board of the National Association of Nurse Practitioners in Women's Health for 18 years. Jaimie Chausmer 02MN would not have become a family nurse practitioner had it not been for Freeman. Chausmer did not perform well on standardized tests and sought out Freeman to plead her case for entry into the FNP program. "I asked her to please take a chance on me and that I would not disappoint her," Chausmer recalled during her mentor's retirement celebration. She thrived in the program. "I graduated with highest honors," added Chausmer, now a mid-level provider at Northside Hospital Cardiovascular Care. "I am a nurse practitioner, and I owe it all to Sarah Freeman." Tribute gifts honoring Sarah Freeman may be made to the Emeritus Faculty Scholarship Fund. To learn more, contact Margot Early, associate director of development, at 404-727-5291 or margot.early@emory.edu .